Dving.net provides calibration in Dota 2. Our crew of players with 5600+ MMR, high KDA and win rate will provide you the best result after 10 games. The higher the initial account rating, the lower chances to get it down in next games. - KDA – correlation of your kills and assists to your deaths. 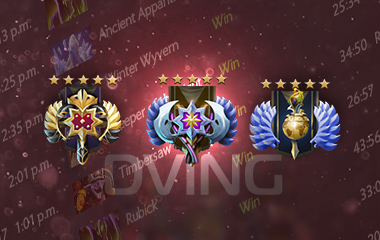 - Skill bracket – level of your play on Dotabuff.com. - Win rate – your wins and losses. The higher these measures, the higher calibration result. - Absolute safety. We are a registered company, working in this direction for many years. - Quick order processing and completing. We process calibration orders every day from 08:00 to 02:00 CET. Average processing time equals 15 minutes. The calibration itself takes 1-2 days. - Eventual MMR from 2500 to 4500 (for solo and team games). - Option to get the new account with high win rate, KDA and skill bracket, which can be calibrated later with the best results.